The British Association for Counselling & Psychotherapy state in their guidelines that all practising counsellors and psychotherapists should have at least one and a half hours a month of supervision each month, depending on their work-load. 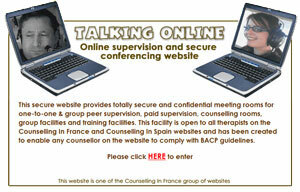 In order to facilitate this, Counselling In France, the mother website to www.counsellinginfrance.com, have provided an online peer supervision website where counsellors can meet to arrange reciprocal supervision free of charge or arrange paid supervision, run groups or can see clients, plus there are training facilities. If you are a counsellor on this website, you are entitled to use the online peer supervision facility which would also allow you to advertise workshops, paid supervision, residential therapies plus online therapy within your own chat room. Please go to www.talking-online.com to access the website.